Picking up where Maxine Waters left off, saying Kanye should be shut down. “The time has come to stop amplifying his platform when he continues to misconstrue facts and distract the public from truth,” writes Ernest Owens, editor of Philadelphia magazine’s G Philly and CEO of Ernest Media Empire, LLC. “Shutting him down is not a matter of censoring opinions; it’s a matter of being responsible in how we elevate or endorse the cult of celebrity in situations that further espouse toxic lies. 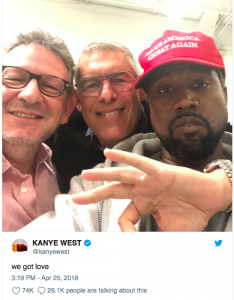 At this point, any outlet that continues to allow Kanye West a platform to knowingly speak such misinformation is either enabling the former or exploiting his celebrity status for ratings,” Owens said.